Rice Diet was created way back in 1939 by Dr. Walter Kempner. In the beginning this diet was intended for people with high blood pressure, kidney problems and diabetics. As time passed rice has found its place among popular diets so there are many variations of it which include 3 days, 7 days, 14 days and 40 days rice diet. Does rice increase our weight? At the beginning we noted that not every type of rice is the same. White or a rather high glycemic index, contains plant fiber and with time can cause diseases such as diabetes type 2. Opposed to it brown rice is far more nutritious, less harmful and contains more fiber that contribute to easier and faster digestion. Our recommendation is just brown rice because it will reduce the intake up to 50 - 60 calories per day. As we have already mentioned the diet has several variants, we will give the menu for a diet that is practiced for 3 weeks. Breakfast: it is always the same, cook a cup of brown rice in water without added sugar or salt. You can fix taste with a bit of lemon juice and olive with oil. Our recommendation is to cook brown rice. That which definitely must be done is 1 hour after getting up to eat breakfast and if you go to work then immediately before departure. Snack is fruit: banana, pear, apple, and peach. Lunch in the first week, combine a cup of rice, a cup of beans, peas or lenses and eat a piece of whole-wheat bread, reduce salt intake. Dinner: every day 1 cup of rice and 150 g of meat without fat (turkey breast, chicken breast, fish). Don't add salt, but pour the lemon juice to improve the taste. Eat smaller slice of whole-wheat bread. After the first 14 days there is period of adjustment of your body to the new weight. The best is to go back to the diet in the first week but you add a snack after lunch and before dinner in the form of one dairy meal. It can be a cup of milk or a small fruit yogurt. 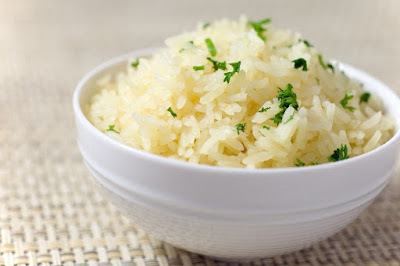 Diet rice should with this diet plan take off 7-10 kilograms of body weight in 3 weeks. Which is definitely a great result. Rice diet is for anyone who wants to weaken while still cleaning the body of harmful toxins, because rice does just that: natural detoxification of the body. As you can see cooking rice is losing a significant amount of calories, and that is so because in cooking rice absorbs a lot of water. Rice as is very popular side dish when cooking. Many people believe that cooking rice takes a lot of time, which is true but our advice is to cook larger amounts at once. Rice diet requires the consumption of rice each day. In 1 cup of rice uncooked add 2 cups of water. Leave it to stay the night because it will thus pull the water and the next day it will be easier to cook. Do not put it in the fridge. In the morning rinse thoroughly with water and cook until tender. Rice diet relies mainly on brown rice, because white has a lower nutritional value and contains significantly more calories. Rice gives energy, improves digestion and bowel movements, stabilizes sugar, and is an excellent source of vitamins especially B1. It belongs in basic foods in eastern countries, and is considered that it is consumed by at least 50% of the global population. It is widespread and there are over 4,000 different varieties. Read also the next diets on our website: Fruit diet in five days, dash diet, kefir diet, the Brazilian diet, anti-candida diet, month diet, Atkins diet, cellulite diet for weight loss, diet with broccoli, diet without carbohydrates, etc.